The pirate flag, as posed for Fortune Magazine in 1984. 2. It's better to be a pirate than join the navy. 3. Mac in a book by 1986. I think the "pirates" remark addressed the feeling among some of the earlier team members that the Mac group was getting too large and bureaucratic. We had started out as a rebellious skunkworks, much like Apple itself, and Steve wanted us to preserve our original spirit even as we were growing more like the Navy every day. In fact, we were growing so fast that we needed to move again. In August of 1983, we moved across the street to a larger building that was unimaginatively designated "Bandley 3". I had worked there before, in 1980, when Apple had initially built it to house the original engineering organization. But now it was to be the new home of the newly christened "Macintosh Division", over 80 employees strong. Capps had already made a few exploratory forays onto the roof during the weekend while a few of us looked out for guards on the ground. At first, he thought he could just drape the flag on the roof, but that proved impractical as it was too hard to see, especially when the wind curled it up. After a bit of searching, he found a thin metal pole among the remaining construction materials still scattered inside the building, that was suitable to serve as a flag pole. Finally, on Sunday night around 10pm, it was time to hoist the Jolly Roger. Capps climbed onto the roof while we stood guard below. He wasn't sure how he would attach the flag, and didn't have many tools with him. He scoured the surface of the roof and found three or four long, rusty nails, which he was able to use to secure the flag pole to a groove in the roof, ready to greet the Mac team members as they entered the new building the next morning. We weren't sure how everyone would react to the flag, especially Steve Jobs, but Steve and almost everyone else loved it, so it became a permanent fixture of the building. It usually made me smile when I caught a glimpse of it as I came to work in the morning. The flag waved proudly over Bandley 3 for about a month or two, but one morning in late September or early October, I noticed that it was gone. It turns out that the Lisa team, with whom we had a mostly friendly rivalry, decided it would be fun to steal the flag for themselves. I think they sent us a ransom note or something, so a few of us stormed over to the Lisa building to retrieve it, which we accomplished, although Capps had to wrestle it from the grasp of one of the secretaries, who was hiding it in her desk. The flag continued to fly over Bandley 3 for more than a year. I think it was even photographed for a magazine or two during the Mac introduction. But suddenly one day it was missing again, and I'm not sure if anyone knows what happened to it. It would be a great artifact for the Computer History Museum if it ever turns up. 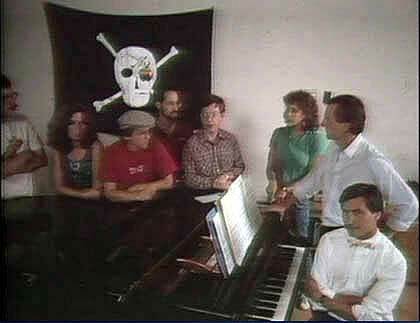 The eight Apple employees in the picture gathered around the piano in the lobby of Bandley 3 are, left to right, Bill Atkinson, Caroline Rose, Chris Espinosa, Bill Fernandez, Bob Belleville, Susan Kare, John Sculley and Steve Jobs. I remember seeing that flag years ago in the 91 megs Quicktime movie that was hidden on the System 7.1 CD that came with the Centris/Quadra 660av (Tempest) and 840av (Cyclone). It was a pretty long candid movie made by the Cyclone/Tempest team celebrating the completion of their project. It seems they still had the pirate flag, or maybe it was a new one. I will try to get the CD from a friend who had a Centris 660av so I could watch it again because it's nowhere to be found on the web (given it's size I guess). The hidden Quadra AV movie has been posted here: http://www.pitt.edu/~clh23/quadraeasteregg.html It is not the same pirate flag, appearing to be your regular store bought jolly roger. Someone should post the easter egg on eeggs.com. Burrell took the pirate thing pretty seriously. I had a sailboat in Redwood City marina in those days, and we'd go out on it from time to time. Burrell would hang off the front, making appropriate pirate sounds. Arrrrh, Mateys! 'Tis true! In 1983, I was a staff photographer with the San Jose Mercury News. One afternoon, I was stuck in traffic on Interstate 280, a partially completed beltway around metro San Jose. As I fumed about this day's congestion, I looked across the freeway and noticed a pirate flag flapping in the breeze atop a tall pole on a distant building. I burst out laughing, and grabbed the microphone on the two-way Motorola radio in my company car. I was stuck in traffic and late returning to the newspaper to process film for a daily deadline, but I had to share what I was seeing with someone. I reported the scene to a picture editor. We had a good laugh and speculated that it might be a Silicon Valley electronics employee playing some sort of joke. I made a mental note to check it out later and perhaps photograph it when I had time. Sadly, I did not follow through. It would not have made for a particulalry great or artistic photograph, but as it turns out, it might have been a historically significant image. As is sometimes the case in news photography, I never saw the flag flying again... A few months before, I had received a Business section assignment to photograph some guy I'd never heard of named Steve Jobs at his home, in Cupertino, I think. I vaguely remember photographing him sitting on the bare floor of an empty living room in the Yoga-inspired lotus positon, and thinking, "this guy is not your average business owner." He was very nice. As this was before the Mac was introduced and I was not yet interested in personal computers, the significance was lost on me at the time. In another inexplicable development, while the Mercury News had an excellent filing system for photographer's negatives maintained by a professional librarian, the film from this particular assignment appears to have been misfiled or lost. Some years ago, I retrieved all my old negatives from my former employer, and the envelope containing images from this assignment was nowhere to be found. To this day, I occasionally look through my file drawers containing all those assignment enevelopes and old negatives, with the hope that it was misfiled and will magicaly turn up. "Mac in a book by 1986." What does this mean?